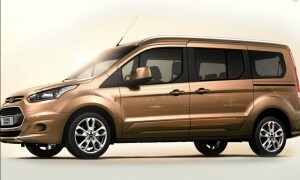 The Ford Grand Tourneo is a seven seat large MPV, it’s easy to see that it’s based on the Transit Connect van but don’t let that put you off as the underpinning is shared with the Focus and C-Max and these are the best driving cars in their class. 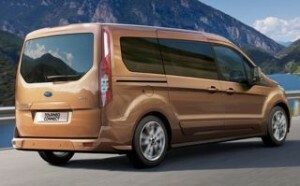 The Grand Tourneo is a very large vehicle (4.8 metres long) and if you need to carry seven people then size really does matter, the two large 7 seat cars on the Scheme presently are the VW Sharan and the Ford Galaxy but even these cannot offer the feeling of space for the rear passengers, particularly headroom. The dash is neatly designed, and although it is probably best described as hardwearing, there are plenty of passenger car touches and good equipment levels. 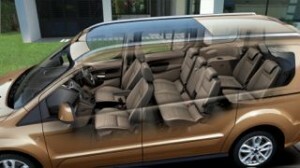 There are two rear sliding doors affording excellent access to the rear. the 839mm opening width is the best in class. Legroom and, predictably, headroom is excellent. 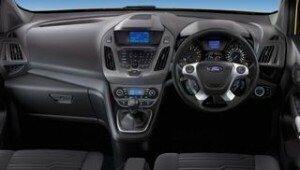 The second row of seats split and fold, but the lack of three individual seats seems more than slightly odd, it is simply careless by Ford as folding and replacing the seats isn’t as intuitive as the competition and removing them completely is a big job, those things are heavy. The third row seats do slide to increase legroom as required but the second row sadly do not. The Grand Tourneo comes as Style, Zetec and Titanium models, avoid the Style as it simply is the transit with seats and windows, the Zetec has electrically-operated and heated door mirrors, front fog lights, heated washer jets, air conditioning, quickclear windscreen, DAB Radio / CD with SYNC and electric windows. Titanium models adds 16″ alloy wheels, rear privacy glass, power-foldable door mirrors, rear parking sensors, rain-sensing wipers, automatic headlights and wipers, panoramic glass roof, dual zone electronic air conditioning, privacy glass, cruise control and a heated drivers seat. The Grand Tourneo is paired to a 1.5 litre diesel avaialble with 120bhp paired to either a 6 speed manual or 6 speed powershift dual clutch automatic. Performance is not quick as it takes 12.6 seconds to reach 62mph but the economy is an excellent 64.2 mph as a manual or 56.6 as an automatic. *The smaller 5 seat Tourneo Connect is priced at £795 and £1095 for the same engine, manual and automatic.